We appreciate your review! We are sorry this coffee maker stopped working properly for you. If you are looking for a different recommended product, please contact our Customer Solutions team. We appreciate your review, David! If you are having any issues with the product you have purchased, please contact our Customer Solutions team. Unfortunately this item is out of the warranty period. We appreciate your review, Norman! If you are looking for a different product that will better suit your needs, please contact our Customer Solutions team. Thank you for the review! We're sorry this machine has not worked well for you. A Customer Solutions Representative will be in contact with you about this. Thank you for your review, Timothy Parsons! 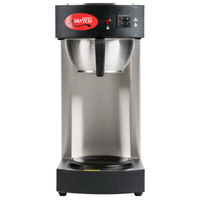 We are sorry this Avantco C10 12 Cup Pourover Commercial Coffee Maker with 2 Warmers- 120V has not worked well for you. A Customer Solutions Representative will contact you soon! We appreciate your review, Brian! Our Customer Solutions team is currently assisting you in figuring out this problem. We appreciate your review, Laurie! If you are having any issues with the product you have purchased, please contact our Customer Solutions team. We recommend using this coffee maker for light duty applications only. Thank you for your review! We are happy to hear that you like this coffee brewer. We recommend looking in the replacements tab located on the product page to find parts for this item. Try this Avantco C1015GARD Wire Guard for C1015BASK Coffee Brewing Funnel to replace the one that was lost. Thank you for your review! We are sorry to hear that you received a defective item. A Customer Solutions Representative will be contacting you shortly to resolve the issue. Thank you for your review! We're sorry to hear the burner wen't out. We do carry replacement heating elements, item number 177CPLTELM. Please feel free to contact a Customer Solutions Representative for further assistance.